Bass & Flinders’ Truffle Gin combines fresh Black Perigord Truffles with the distillery’s meticulously crafted eau de vie, a grape-based spirit produced in-house which lends this gin its smooth texture. To complement the earthy truffle flavour, juniper, angelica root and calamus root are vapour infused together in small batches to yield the best quality spirit. The gin has been crafted to accentuate the earthy characteristics of fresh Australian Black Perigord Truffles that have been sourced from local farms, where possible. 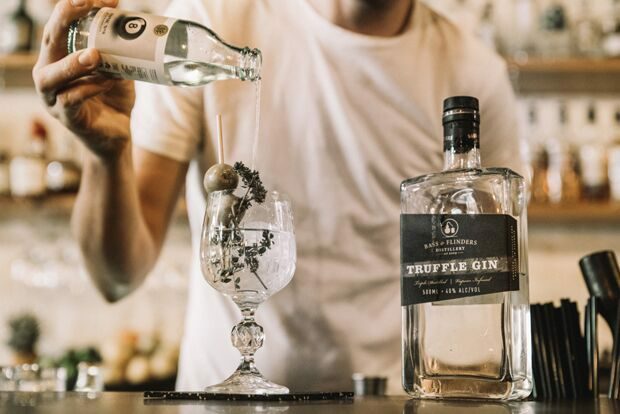 Truffle Gin is best served neat or in a truffle martini to showcase the delicate flavours of the truffles, garnished with a sprig of fresh thyme. Truffle Gin is a seasonal offering from the distillery and is available until stocks last. With only a very limited number of bottles, this product is a rare offering for bar guests over the winter period. Bass & Flinders is proud of its innovative approach in offering seasonal products using botanicals and other flavours throughout the year. “Our small scale, innovative approach provides us with a fantastic opportunity to be creative and produce products relevant to the current season.” Holly Klintworth, Head Distiller, Bass & Flinders Distillery. Premium Spirit Brand Ambassadors wanted!